← Will your artwork last? 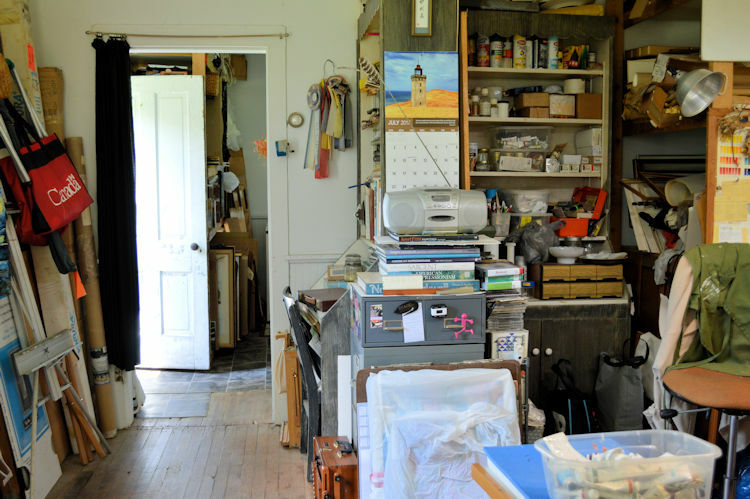 Studio visit – where the magic happens! Posted on July 31, 2017 | Comments Off on Studio visit – where the magic happens! 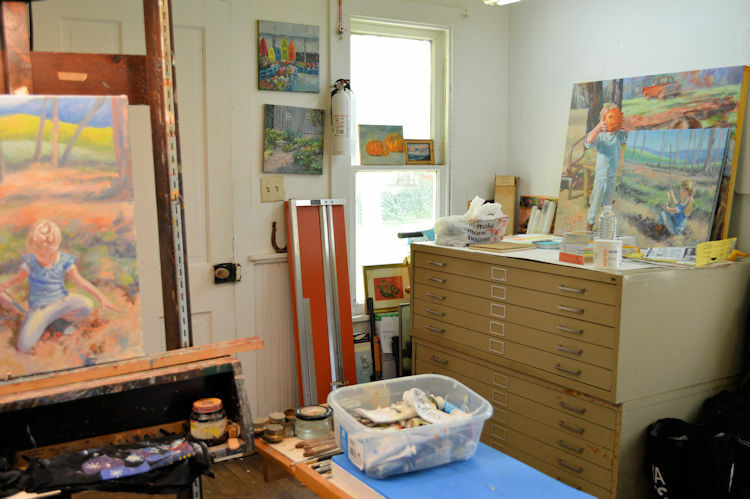 My studio is the old summer kitchen surrounded by herbs, flowers and giant maple trees. 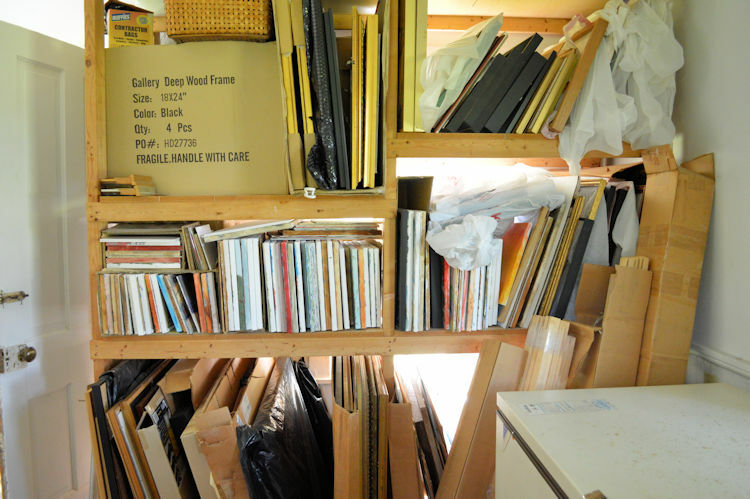 I love to visit the studios of other artists, to nose around and see how they work, what materials they use, how they store materials and artwork. Sometimes I get great ideas but it’s just wonderful to see what the other artists do. 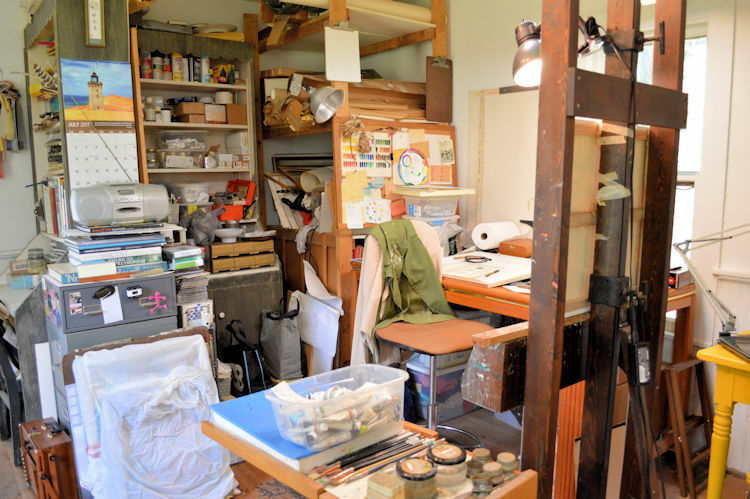 So I’m inviting you to visit my studio. 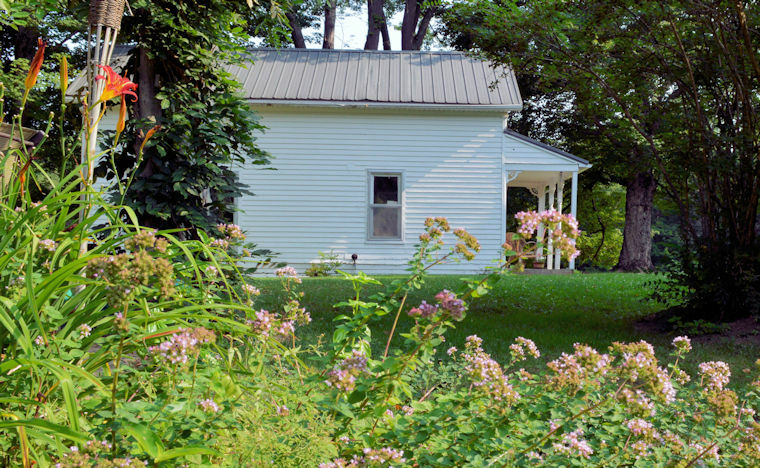 Over thirty years ago, my husband and I decided to leave the corporate world and purchased a small farm in Southern Indiana. This was always a dream of mine so he mostly came along for the ride. If you are not familiar with this part of the country, it is totally beautiful with woods and fields, gently rolling hills, lakes and streams. And not too many people. I like to say it’s like New England without the crowds. We live in a 150 year old farm house with a large garden, a couple of orchards, and plenty of the aforementioned woods and fields and streams. We raised two sons here and have enjoyed living in a county that doesn’t even have one stoplight…and we’re proud of it. 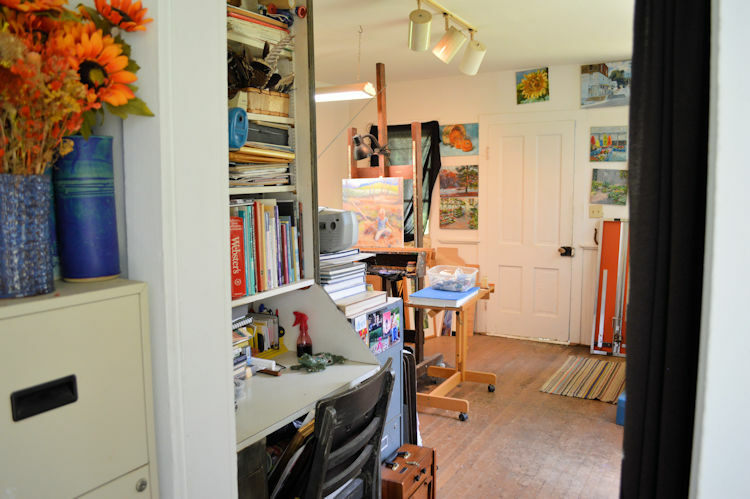 My studio is the old summer kitchen so my commute is about 30 feet from the back door. 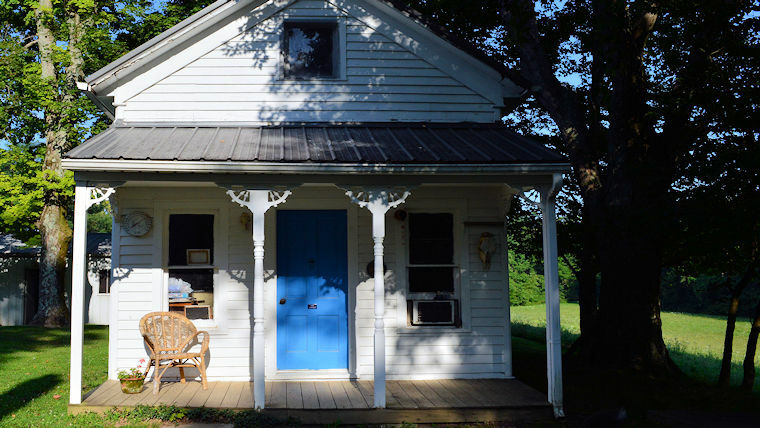 For those of you who are not familiar with this term, summer kitchens were popular in the days of wood-fired stoves to keep the heat out of the house…in the summer! They are very common on old homesteads in the midwest and south. And it’s very nice for me to have an area to keep my art separate both physically and mentally from the rest of the house. Thanks so much for stopping by. Don’t forget to visit my art website at kgmiracle.com or my Etsy shop. 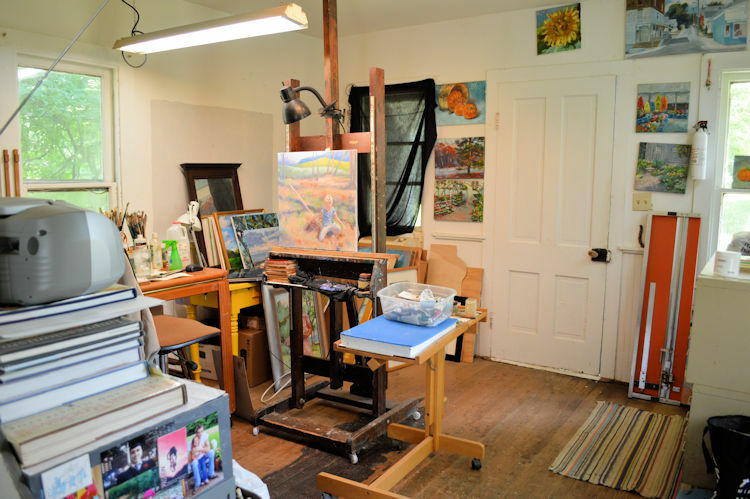 My Blue Door Studio,the old summer kitchen is about 30 feet from my back door. The blue is Electric Blue, a lucky southwest color. Hey, why not? View from the front door through the studio. It is a two-room space. View from my artist chair to the front door of the studio. 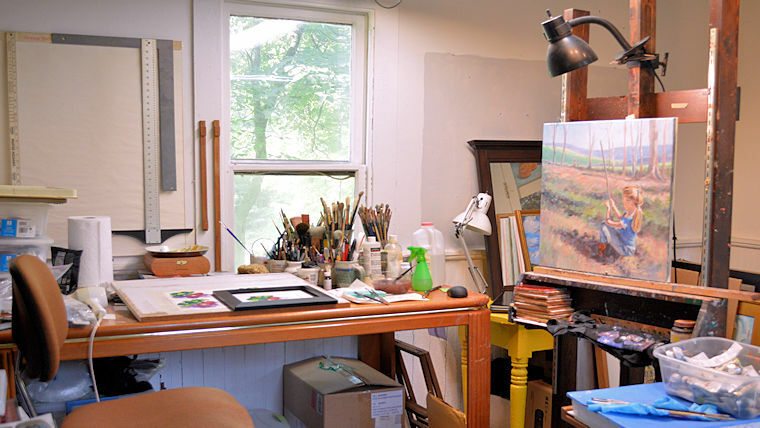 A broader view of the front room of the studio. This used to be the dining room for the field hands during the summer. It may looks a bit haphazard but I know where everything is…usually. Broader view from the back room into the front room. 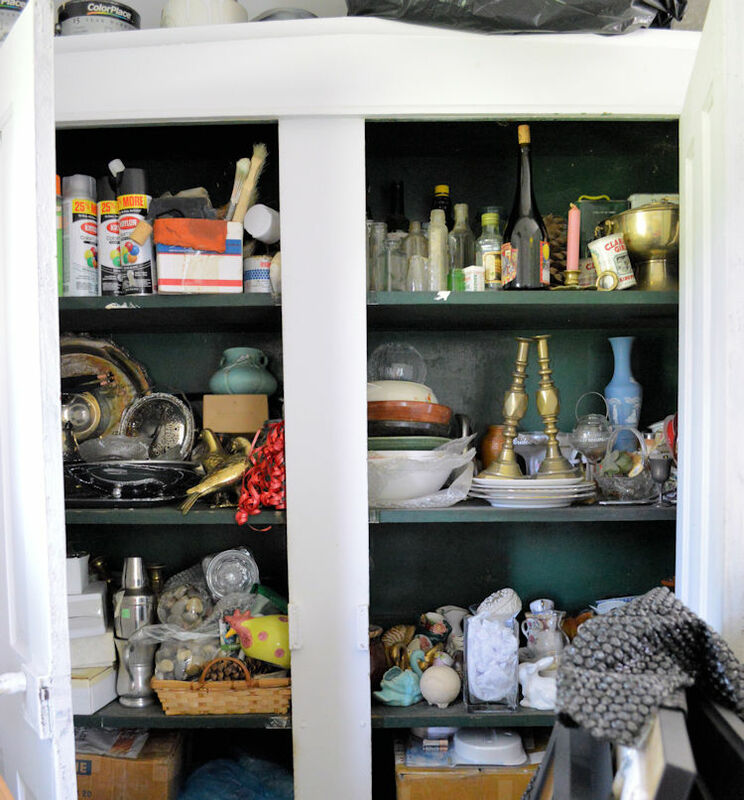 This large pantry in the back room of the studio is where I store many objects for still lifes. The old wood cook stove was back here, too. I can’t imagine how many meals were fixed here, as well as all the canning that was done. Storage is always a premium for artists. Where does one PUT all this art? This is where the magic happens. The easel for oil painting. The flat table for watercolor and some drawing. Everything I need within a hand’s reach. This entry was posted in art, country living, garden, still life and tagged art, country living, gardening, indiana, kit miracle, oil painting, old house, southwest, studio, studio visit, summer kitchen, watercolor. Bookmark the permalink.